BetOnline Poker has introduced a new player poker bonus which offers a 200% match bonus on first deposits made by new players up to $2,500. BetOnline is a major skin on the Chico Poker Network and first opened its (brick and mortar) doors to sports bettors in 1991. The site developed a formidable presence in the US online gambling market in the early part of the last decade, but until now has directed its deposit bonuses to sports bettors and horseracing enthusiasts. At long last, it has made an effort to attract new players to its US-friendly online poker site with the introduction of a 200% match bonus on first deposits up to $2,500. Players who deposit between $50.00 and $1,250 after registering a BetOnline account will be entitled to a bonus of double their initial deposit once they have advised BetOnline´s Customer Support of the date and value of their deposit (special email address for the BetOnline bonus is freeplay@betonline.ag). The bonus is then released into players´ accounts in five stages as players collect POP Points (Player Option Points) by contributing to the rake deducted from the pot in cash games or by paying a fee to enter a sit n go or multitable poker tournament (10 POP Points are awarded per dollar). 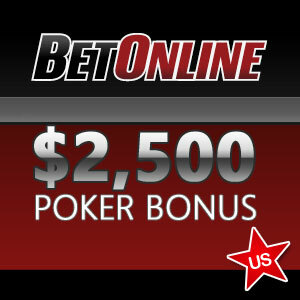 The release of each stage of the BetOnline poker bonus occurs when a player has paid specific percentages of their first deposit in rake or fees, and the bonus structure is tailored so that recreational players will find it easy to collect some of the bonus if they are unable to clear the full amount. Players have 120 days in which to collect sufficient POP Points to clear the full BetOnline Poker Bonus. You can receive the bonus when you use promocode POKERNEW in the cashier when you make your deposit. Already the introduction of the new player poker bonus has had an effect on the traffic at BetOnline Poker. Whereas the site usually averages around 300 cash game players, the introduction of the BetOnline new player poker bonus has seen numbers increase to a peak of 500 in recent days. The site is also hosting a $25,000 guaranteed tournament on Sunday 28th July with a $75.00 + $7.50 buy-in (3 re-buys plus 1 add-on allowed before first break) which has the potential to be significantly undersubscribed as there are no satellites scheduled for the event. However, players should be aware that a number of sit n go and multitable poker tournaments allow players to use their POP Points as buy-ins and, if POP Points are spent to enter these events, they are deducted from the total earned in pursuit of the BetOnline new player poker bonus.